We’re all pretty good at picking out a pair of black dress shoes, but what happens when summer rolls around and you want something lighter that still works at the office or a fancy restaurant? We’ve walked you through sport coats and wallets, and now, to complete your warm weather look, you’ll need the right pair of shoes. Here are two classic types of summer dress shoes for the office, and two for a weekend on the town. Brogues: Brogues (also known as Oxfords) are an iconic shoe with a lengthy history that have now become commonplace in settings of business or formal dress. 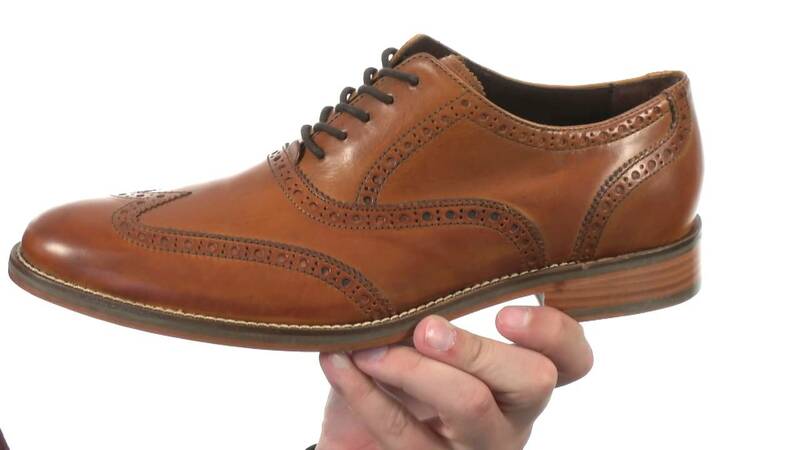 The Western world tends to favor the half brogue, which is a slightly lower cut shoe with fewer panels than the original full brogue style mastered in Europe. Choose a pair that is still marked with the characteristic perforations the shoe was named for and opt for a warm color to match the lighter hues you’ll be wearing over the Summer season. They should also still be neutral enough to wear with a range of suits and match your daily accessories like your belt and wallet. A light brown or even beige option works great. Also, if you’ve never purchased this shoe style before, don’t be a hero. Opting for the two-tone style of shoe if you’re not a meticulous coordinator of colours will make you look more Rock-A-Billy than businessman in many cases. Stick to minute perforations and simple patterns as well. The more minimal the shoe to more businesslike the look. Less is more. Penny Loafers: At the time of their origin, penny loafers as we now know them were house shoes designed for the aristocratic class in the United Kingdom. The sixties marked their entry into the North American business world, and the dapper stylings in Mad Men could be credited for bringing them back to forefront of style by 2015. The penny loafer’s tell-tale design feature is a small slit where the toes meet the arch of the foot on the top of the shoe. Some versions of this shoe can err on the side of too casual for the office. A way to tell if this is the case is to compare them to a moccasin. If they’re too close to the unstructured, multiple panel design of slip-ons, then stay away. For business, invest in a pair you’ll only have to purchase once every ten years. Minimal paneling means solid, uninterrupted pieces of leather construct the shoe which helps it mold to your foot more quickly and makes wear and tear more uniform to create a gorgeously aged leather look. Canvas Sneaker: Canvas sneakers may be the most ubiquitous casual shoe in North America. They’re favored by home run hitters on the baseball field, and they’re ever popular among groomsmen at more casual weddings. With a thick and adaptable rubber sole, they’re another shoe that forms perfectly to the foot after an admittedly slightly uncomfortable break-in period. When low cut, canvas shoes can be worn with almost any outfit on any occasion. The most recognizable brand is Converse. To keep your choice more on the mature side, opt for a monochromatic version (they come in a dizzying number of colors and color combinations). Bright white is a clean and crisp addition to a pair of dress shorts and a button down shirt for Saturday evening drinks at a lounge with a lax dress code, but a strict style code. Or, pair them with cargo shorts and a high quality t-shirt for an early afternoon outdoor gathering. Classic Boat Shoe: Boat shoes are ever-popular, even leaps and bounds from the pier. Typically made in either canvas or leather, these are a step up from the canvas sneaker, though not technically formal footwear. Paul A. Sperry first made them in 1935, and the Sperry brand name still represents the highest quality boat shoes. As the name “boat shoe” suggests, these casual shoes are perfect for a summer evening on a waterfront patio. Typically worn without socks, you might chose to continue the nautical look throughout your outfit. A pair of light khakis and a polo shirt compliment these comfortable and always-trendy weekend shoes perfectly. And feel free to wear them right up to the water’s edge; they’re made to wear in nicely in just such conditions. With one of each of these styles in your closet, there’s no summertime social situation in the world that could trip you up.